kmurphydesigns | I'm K Murphy. I design. If I could (and it wasn’t such a pain in the…ahem) I would cover everything in resin. Everything! Resin and I have a special relationship. I’ve completely mastered the art; it IS art. There are many different processes that use resin, none of which are a cakewalk! For this bracelet I’ve used a hand-pouring technique which keeps the images forever encased in its shiny-glassy-goodness. It makes the bracelet completely waterproof which is why it’s way more expensive than the cheapo glass dome jewelry. It also takes days to complete one project, which is another reason for the price. A bracelet like this takes days to complete. After the images are ready, they need to be waterproofed before starting the resin process. I work with a two-part resin, so measuring has to be exact or the whole project will be ruined. This is when I get to play chemist! Then the fun really starts by pouring in a teeeeny-tiny bit at a time to cover the photos. Overflow is a huge issue with resin, and it’s not something you want to clean up…believe me! Then it happens. You’d never understand what I mean without seeing them (I will have to remember to shoot a photo!) They are the most terrible things. Ever. These aren’t cute, pop-able bubbles. They’re almost microscopic! This is the only reason I haven’t covered everything I own in resin! I’ve seen many people go-with-the-flow and leave bubbles in their designs, which works with some things but definitely not photo jewelry. Rest assured, I’ve mastered them too. They may just be the most time consuming part of working with resin (besides the curing time) but it’s absolutely worth it to me. Look at these babies. They’re perfect! I spend so much time working on each piece that I feel like Gollum (Lord of the Rings) saying “my precious…” *insert creepy voice here* But (hopefully) not quite as creepy. Posted in Jewelry and tagged etsy, jewelry, kmurphydesigns, my precious, resin. Bookmark the permalink. First Giveaway! Win a Custom Photo Cuff! My FB page has reached 100 fans so let’s celebrate! One lucky fan will win a Custom Photo Cuff! 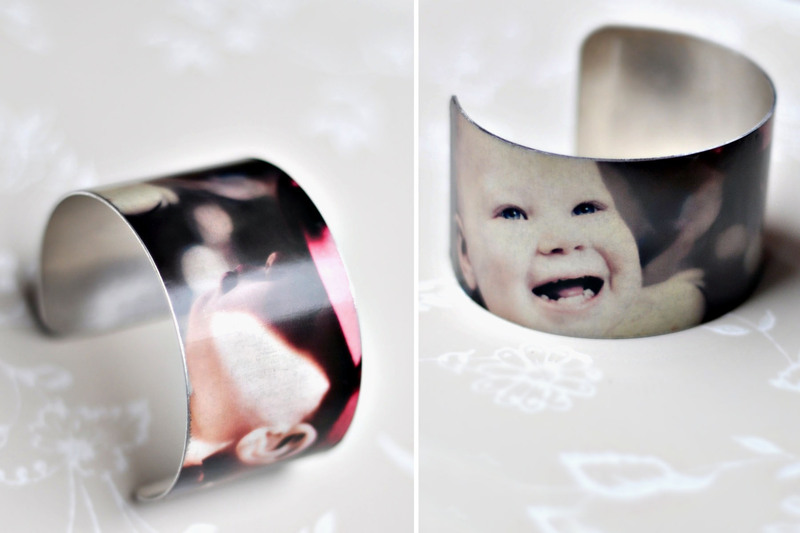 Do you have two photos you’d love to have wrapped around your wrist? Yes! Well, make sure you enter! The winner’s cuff will feature two of their favorite photos on a 1 3/4 inch (44.5mm) aluminum bracelet! You can chose any color monotone, sepia, black and white or full color for your photos. Both photos will be merged together to fit the cuff. The cuff is made with 100% pure aluminum and will have your images permanently embedded on it. Aluminum is lighter than sterling silver and is a better choice for those with metal allergies! This cuff is virtually waterproof, scratch resistant and so comfortable to wear. The nice thing is that you are able to bend it slightly to tighten or loosen it for your wrist. * Subscribe to my (brand spankin’ new) blog . * Blog about this giveaway and leave me the link. This giveaway will end on May 15th at 9PM ET. Giveaway is open to Canadian and US addresses only. Posted in Giveaway and tagged etsy, giveaway, jewelry, kmurphydesigns, photo. Bookmark the permalink. I am K Murphy. I design. Well, that pretty much sums it up. This is my first post for my new blog, and I’m aiming to keep it short and sweet. If you knew me, you’d know how impossible a simple feat like that actually is. I’m a blabber-er: in person, on paper, via text, email…you get the gist. Just wait, you’ll see! Ironically, I hadn’t planned on starting my blog yet even though I’ve been thinking about it for months. I’m so ridiculously busy that I couldn’t imagine adding one. single. thing. to my daily activities but I had no choice. I blame FaceBook. Who knew it was illegal to do a simple Giveaway on FaceBook? How absurd is that? I decided today that once I hit 100 Fans I would do a Giveaway. Long story short – voila, now I have a blog! My quickie layout and graphics will change eventually but I just wanted to have it up so I can post the Giveaway information soon! I will do a proper intro and life-story in the coming posts. I have to be a little mysterious, don’t I? 11-365 This is a pretty common smirky face of mine! At the start of the New Year I swore I would take part in a 365 Self Portrait Project...I lasted 34 days. HA! I had NO idea how difficult SPs were, technically and emotionally. Unfortunately, I just ran out of hours in the day. I do hope to get back into it at some point. It's amazing what you can learn about yourself from being behind AND in front of the lens.